Find places to stay in Monterey Park, CA and other fun things to do. View our list of attractions, activities, events, restaurants and visitor information. Free breakfast complimentary internet and on-site fitness facilites are the prime perks guess find at the Best Western Markland Hotel. Free Internet, Free Breakfast, Non Smoking Rooms. With free internet and free breakfast plus a nice price Comfort Inn Monterey Park is an affordable option near Dodger Stadium. This 50-room hotel on three floors offers rooms with cable TVs free Wi-Fi work desks and plenty of space to stretch out and get comfortable. Free Internet, Non Smoking Rooms. Located in East Los Angeles GARVEY INN is a perfect starting point from which to explore Los Angeles (CA). The property features a wide range of facilities to make your stay a pleasant experience. Free Internet, Non Smoking Rooms. Offering free WiFi and garden views Great and Safe L.A. Home is an accommodation located in Monterey Park. The air-conditioned accommodation is 10 km from Los Angeles.This holiday home has 4 bedrooms a living room and a fully equipped kitchen with a dishwasher. Featuring free WiFi King Lodge Motel offers accommodation in Monterey Park.Los Angeles is 11 km from King Lodge Motel while Santa Monica is 34 km away. The nearest airport is Bob Hope Airport 27 km from King Lodge Motel. Non Smoking Rooms. 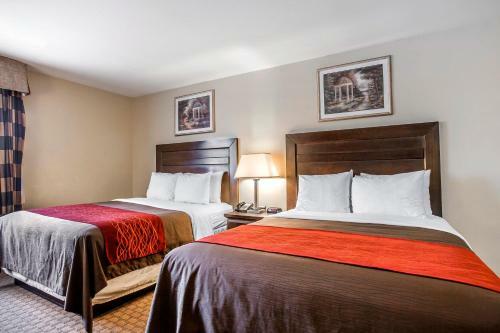 Adjacent to Atlantic Times Square and surrounded by Korean Chinese and Japanese restaurants and culture the non-smoking Best Western Monterey Park Inn is a find for our guests. Swimming Pool,Outdoor Pool, Non Smoking Rooms.